Emerald Lake in British Columbia is an enchanting destination in both winter and summer although it is often overshadowed by its more famous counterparts such as Lake Louise and Moraine Lake. While the crowds flock to Banff National Park in Alberta, those in the know head further afield to Yoho National Park, near Field BC, roughly an hour west of Banff along the TransCanada Highway. While not in Alberta, we decided it should be included in our Alberta Bucketlist because it is something extraordinary that can be visited on a weekend trip from Calgary or Banff. A site as captivating as Emerald Lake deserves equally exquisite lodging to round out the experience, and nowhere is more worthy than Emerald Lake Lodge. This iconic hotel is serious about allowing you to get away from it all. There is no cell phone reception in the rooms, no Wifi (except at the lodge itself), and the rooms do not have TVs. Instead, most rooms offer wood burning fireplaces, at the lodge itself there is a bar made of salvaged wood from an 1890s Yukon saloon, there is an outdoor hot tub with a view on the premises, and a few excellent restaurants, including one right on the lake. There isn’t much in this world that’s better than dipping into an outdoor hot tub during the winter or cozying up with someone you love by a wood burning fire to keep one another warm! This setting however, comes with a price and it is not the most budget-friendly option. Still, there are deals to be had. For example, a mid-week stay is positively affordable and the rooms are spacious enough to self-cater, which is exactly what we did. Wanting to save some dosh for future travels, we loaded up on delicious treats in Calgary and prepared a feast for the ages in front of our wood burning fireplace. Unfortunately, with winter hanging on in the mountains there were no views to speak of from the balcony so we tucked into our food and enjoyed a cozy night by the fire. 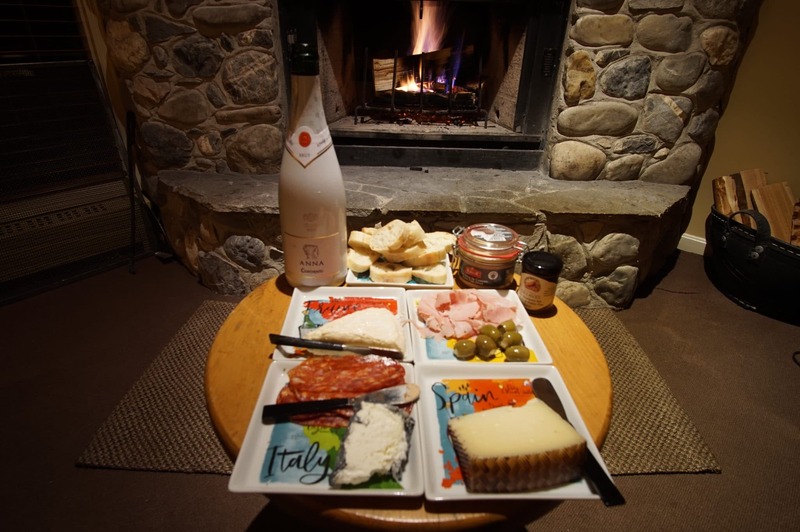 Cozy in front of the fire with our home-made charcuterie feast! In addition to its indoor features, there are also beautiful hiking trails like Takakkaw Falls, and canoes for rent in the summer. If you’re into photography, or just admiring nature, Emerald Lake is one of the most beautiful destinations in the Rockies. The lake frozen over and mountains covered in snow adds to an already incredible landscape. In the winter there are multiple cross-country ski or snowshoeing trails with Lake Louise and Kicking Horse ski hills are nearby as well. 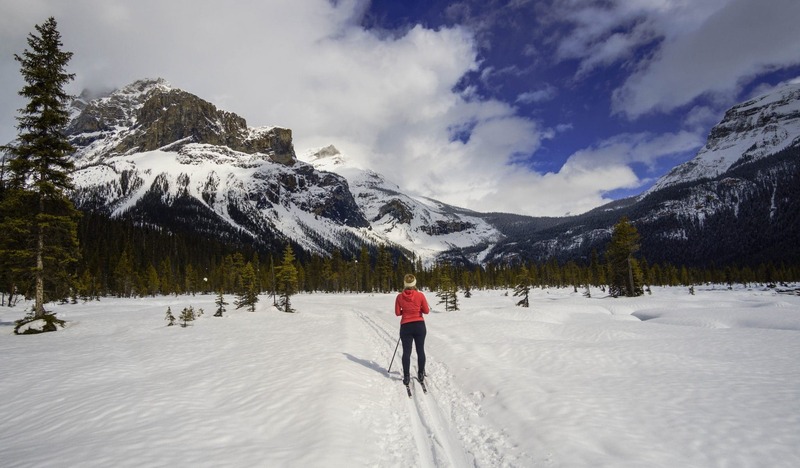 If you have never tried cross-country skiing before, you definitely should! It’s one of the easiest and most affordable winter sports to get into (and infinitely better than snowshoeing IMHO). Attracted to the prospect of skiing in a place where the views would fill us with awe at every glide, we prepared ourselves with a hearty breakfast from the lodge and enjoyed one last soak in the hot tub while we waited for the clouds to clear. When they finally did we headed out to ski the lake. Although it looked like winter was still in full swing, the cross country ski trails along the lake which are maintained by the fine folks at Kicking Horse Ski Club, were getting pretty thin and slushy in some spots. Having heard only good things about the Alluvial Fan Loop that can be reached via the Emerald Lake trails, we hugged the tracks along the shore, appropriately named “Tree Hugger”, and made our way toward the loop. The clouds cooperated and gave us this magnificent view! The clouds continued to cooperate with us as we cross country skied to the end of the lake in search of the Alluvial Fan Loop trail. It seems like most hikers and snowshoers end their journeys where the Alluvial Fan Loop starts. The perfectly-formed track takes you through a mountain meadow where you can glide past views of Takakkaw Falls and glacial peaks. The trail circles back to the lake to return to the Lodge or your vehicle. The lake trails combined with the Alluvial Fan Loop make a circuit of about 14km, just enough to work up an appetite for lunch at Emerald Lake Lodge or a delicious picnic around the lake. Admiring the view while cross country skiing the Alluvial Fan Loop. 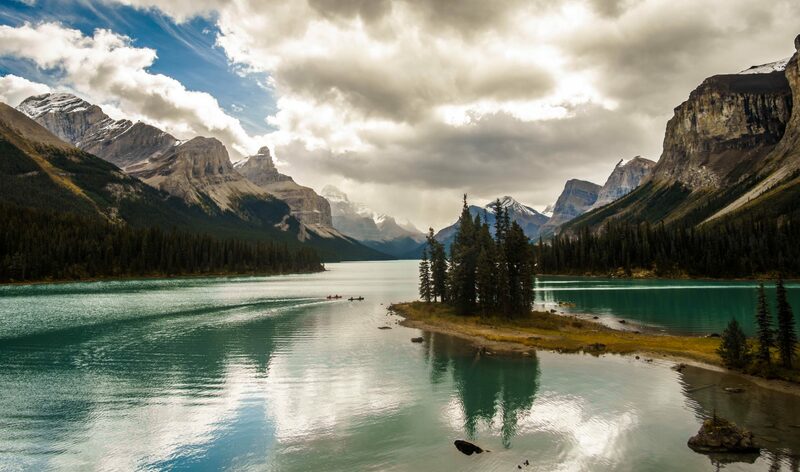 There are other sites nearby, like the Natural Bridge that are also worth checking out, so you may want to budget for extra time in beautiful Yoho National Park. We’ll be back during the summer as we plan to paddle on Emerald Lake and hike the Iceline Trail! 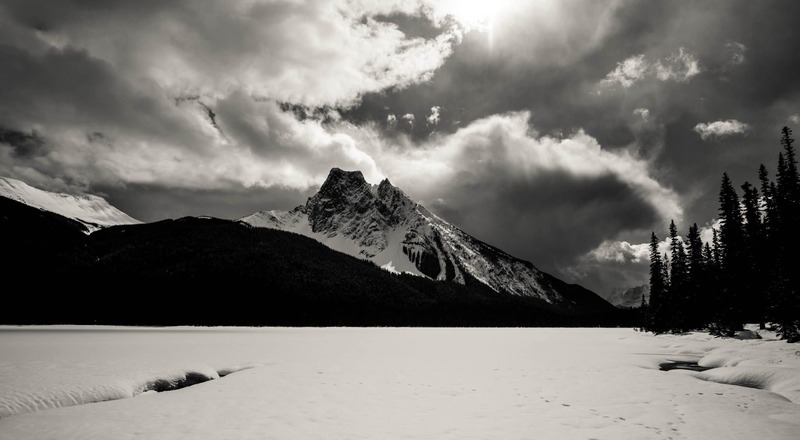 We’re very glad that we finally spent some time in the Emerald Lake area and encourage travellers to stop in while exploring the Canadian Rockies. As an added incentive, all National Parks are free in 2017 to celebrate 150 years since Confederation, so there’s never been a better time to visit Canada’s National Parks! Winter at Emerald Lake, a worthy addition to any traveller’s bucket list!